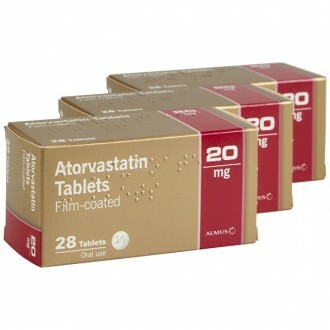 Fluvastatin is a medicine used to treat high cholesterol. The drug helps to control cholesterol levels by reducing the activity of the enzyme responsible for producing cholesterol. Fluvastatin is most effective when combined with regular exercise and a healthy, low-cholesterol diet. 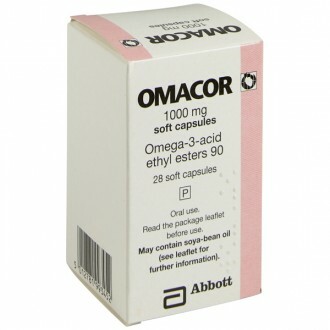 The treatment is available in two capsule dosages (20mg and 40mg) for easy oral use. Although high cholesterol itself doesn’t have any obvious symptoms, the condition can act as a ticking time bomb for other serious health issues. If left untreated, high cholesterol can cause a number of life-changing circulatory problems, including; heart attacks and stroke. This is why being conscious of your cholesterol levels is so important. As well as an awareness, it is also essential that you try and manage your cholesterol levels, through regular exercise and a heart-smart diet. Fatty foods, alcohol, smoking, and a lack of physical activity can all lead to raised cholesterol levels, which is why it is important to make the right lifestyle choices. However, for some, high cholesterol can occur as a consequence of another medical condition, such as diabetes. Genetics can also play a role – having a blood relative with high cholesterol can make a person more susceptible to developing the condition. Cholesterol itself serves a useful purpose in the body. At low levels, the substance is responsible for transporting essential fats to cells via the bloodstream, which allows the cells to grow. This ‘good’ cholesterol is known as high-density lipoprotein (HDL). However, the required amount of good cholesterol is already produced naturally in the liver, so any dietary cholesterol only serves to form an excess. When excess amounts of cholesterol build up in the blood, these fats can stick together, forming blockages that can restrict blood flow. This ‘bad’ form of cholesterol is known as low-density lipoprotein (LDL). 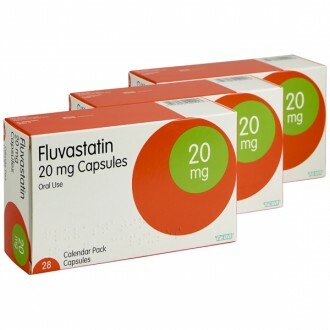 Fluvastatin works by reducing the activity of HMG-CoA reductase, an enzyme found in the liver that produces cholesterol. This lowers the overall levels of cholesterol in the body. Having controlled, healthy levels of cholesterol will reduce the risk of heart attack, stroke, and angina. It can also combat atherosclerosis, which is a hardening of the arteries. Take one capsule per day. Swallow it whole with a sip of water. If possible, make a routine of taking the capsule each evening. It is up to you whether you take the capsule with food or not. To start, you will likely be advised to take one 20mg capsule per day. Your doctor may adjust this dosage depending on its effectiveness and on any side effects. A headache, nausea, insomnia, stomach pain. 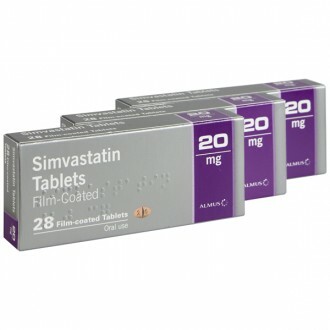 The active ingredient contained in Fluvastatin is fluvastatin sodium. Capsule body – Gelatin, titanium dioxide (E171), yellow iron oxide(E 172), red iron oxide (E 172). Capsule cap – Gelatin, titanium dioxide (E 171), red iron oxide (E 172). Ink – Titanium dioxide (E171), Shellac, Soya lecithin, Antifoam DC 1510, Iron oxide, red (E172), Iron oxide, black (E172), Propylene glycol. Capsule body – Gelatin, titanium dioxide (E171), yellow iron oxide(E 172). Ink: Ink – Titanium dioxide (E171), Shellac, Soya lecithin, Antifoam DC 1510, Iron oxide, red (E172), Iron oxide, black (E172), Propylene glycol. You have severe respiratory problems. If you are allergic to soy or peanut, Fluvastatin may be unsuitable for you – the capsule contains soya lecithin.